A Wigan youth has admitted going on a wrecking spree over a couple of weeks in which £20,000 of damage was caused to shops and cars. 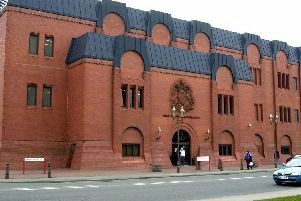 The 12-year-old, who cannot be identified for legal reasons, admitted eight offences of criminal damage at Wigan Youth Court. Businesses at the Robin Park retail hub were targeted under the cover of darkness in December and January, with the Costa Coffee having its windows broken repeatedly as fast as workers could repair them. The youth also twice trespassed in the coffee store and stole sandwiches and other food items. In the most serious incident on January 11 the shop’s windows were trashed, leaving the business with a £9,000 bill. Speaking outside court, Greater Manchester Police (GMP) said the offending was having such a disastrous effect national high street chains were actually considering moving off the retail park. A resident in Norley also had the window of his car wrecked during the crime wave. The youth will now return to court to discover his fate next month once a report has been prepared involving the Wigan Youth Offending Team. After the hearing police spoke of their relief at getting the case in court, saying the preteen tearaway’s outburst of offending had alarmed residents and retail firms while taking up a huge amount of officers’ time. GMP revealed the car owner whose vehicle had been attacked was depending on compensation awarded by the court to be able to carry out repairs. Sgt Paul Higham said: “This crime spree has taken up many hours of my officers’ time and being here in court today is a big result for us. “If this has continued some of the shops on the retail park would have closed down. “I feel sorry for the members of the public and the businesses who have been affected, especially the elderly gentleman who is awaiting compensation to be able to afford the repairs to his car. “This case has given me sleepless nights. I’ve been doing this job for 25 years and I’ve never known a youth constantly commit offences like that, over and over again. Sgt Higham said that as a result of the crime wave businesses at Robin Park were considering clubbing together to pay for round-the-clock security. The court heard that in addition to the car and the coffee store being attacked the TUI, Curry’s PC World and Healthy Lifestyle units at Robin Park were targeted. Prosecuting, Alan Bakker told the court the total damage was in excess of £20,000. The youth was represented during the hearing by Karen Moorfield. He will now be back in court on February 21, by which time a report covering all legal options will have been prepared. He was given conditional bail. A 14-year-old boy was also due to appear in court as a co-defendant, accused of the criminal damage at Curry’s, Costa Coffee and Healthy Lifestyles as well as two separate incidents involving cars. However, he did not appear when called by the magistrates and a warrant has been issued for his arrest. Defending, Graham Simpson indicated his client was likely to enter a mixture of guilty and not guilty pleas to the seven charges he faces.